Sherlock Holmes returns to his Victorian roots for a feature-length New Year’s Day special, screening in cinemas across the US and UK, as well as on TV. Camden is the proud home of the fictional 221B Baker Street – actually filmed on North Gower Street – next to the real Speedy’s café. 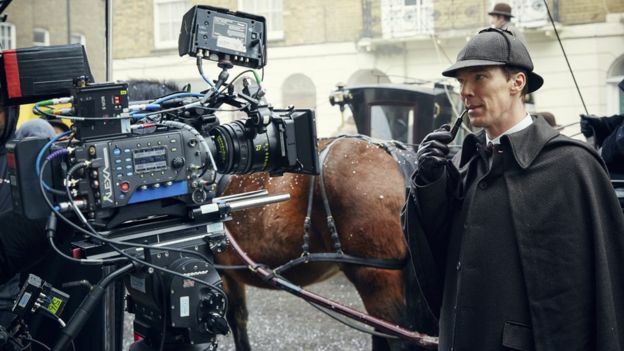 Benedict Cumberbatch’s Sherlock is usually set in modern times, but for this special, shot in February, the story is set in Arthur Conan Doyle’s own Victorian era, with stunning period scenes including horses and carriages. Take a look at the latest trailer here. Together with Martin Freeman as Doctor Watson, Sherlock Holmes is drawn into the mystery of The Abominable Bride, set in 1895. Rupert Graves also returns as Metropolitan Police detective inspector Greg Lestrade, to help out. Thomas Ricoletti’s wife has taken her own life – but now she appears in her old wedding gown prowling London, apparently with a thirst for revenge. Co-writer Steven Moffat shows audiences around the famous 221B Baker Street in extra footage to be screened in cinemas. Viewers can expect a more traditional Holmes in this interpretation, with Cumberbatch embracing the manners of a Victorian gentleman. FilmFixer manages the Camden Film Office. FilmFixer director Karen Everett says, “We always enjoy welcoming the Sherlock Holmes production back to ‘221B Baker Street’ in Camden. Even the normally low-key Speedy’s café next door has become a must-see attraction for Sherlock fans. The Abominable Bride will be screened at 100 cinemas across the UK and 500 in America. Or stay cosy in your PJs and catch the show on BBC One in the UK and PBS in the States.